I am so excited to be a part of this challenge! I look forward to one day looking back on these memories and to also be pushed a bit more on my photography skills. A prize helps as a motivator and doing this along with other moms! Stop by and check out the details you have til May 11th. This is the picture I am linking up for the challenge! Kiss on the nose! One of my faves. This is only a sample for Photo Challenge Participants, I am not participating in the challenge since I am hosting the challenge. I wish I could there are some great prizes. I chose to post 3 pictures for this prompt but I am only linking up one for Prompt #2. When I go link up my picture I will title it on the link up: Prompt #2 and link it back to this exact post not my blog. It's important that I only linked up the picture I want to submit for the challenge. I can't link up the first picture of my son on the toilet and then say it's the second one I want in the challenge. The judges will only consider the picture you link up. 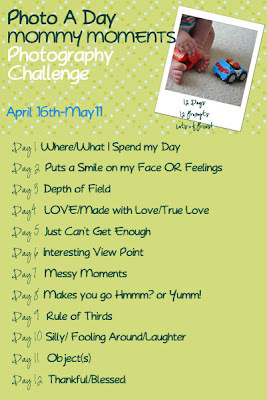 I am doing a May Photo a day challenge! I hope to see you over at my blog or FB fan page!! !